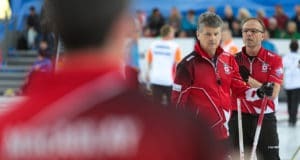 OTTAWA – If there’s one thing that’s been proven over and over again this week at the Tim Hortons Brier it’s that patience is needed, and is usually rewarded. Mike McEwen of Manitoba and Brad Gushue of Newfoundland-Labrador both fell behind early but patiently waited for their opportunities. For McEwen, third B.J. Neufeld, second Matt Wozniak, lead Denni Neufeld and alternate Jon Mead that didn’t come until the seventh end against Jim Cotter of B.C. (2-6; Vernon-Kelowna). The Winnipeg crew fell behind 2-0 in the first, tied it with a deuce in four and were down a single when their chance came in the seventh. McEwen pounced for three. The Manitoba team improved to 6-2 and remained third in the standings behind 8-0 Northern Ontario and 7-1 Newfoundland-Labrador that beat Quebec 7-6. 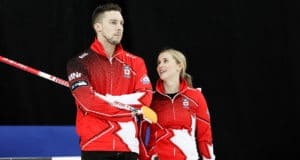 Gushue trailed 3-0 after two ends to Jean-Michel Ménard of Quebec – giving up one in the first and a steal of two in the second – but he got deuces in the third and fifth ends, a steal of one in eight and then made the hit-and-stick he needed with last rock to get the winning single. It was, said Gushue, a bit of a struggle because of the changing ice conditions. “The ice was incredible the first couple of days, very consistent … tonight it was everything but. There were some rocks doing some strange things. That last one, debating on draw the four foot or hit to the wing, I’m playing draw the four-foot every time. But on that ice, I think we played the easier shot. While Gushue and McEwen exhibited patience, Brad Jacobs and his powerhouse Northern Ontario squad were having none of that. The front-runners from Sault Ste. Marie, who have shown plenty of patience through their first seven games, didn’t waste any time in game eight. 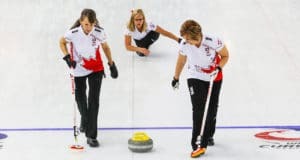 They scored two in the first end, stole three in the second and scored three more in the fourth to roll past Jamie Koe of Northwest Territories (1-7; Yellowknife) 9-2. “That’s just kind of the way it went,” said Jacobs, the 2013 Tim Hortons Brier champion and 2014 Olympic gold-medallist. “We never went out there thinking we were going to end it early because Northwest Territories has given some great teams some great runs this week. They have it in them to play really well and beat anyone. That improved Northern Ontario to 8-0 and ensured they will advance to the playoffs. A win over either Manitoba Thursday afternoon or Newfoundland-Labrador Friday morning will put them into the Page 1-2 game. Not playing in the evening draw were Kevin Koe of Alberta (6-3; Calgary), Pat Simmons and Team Canada (5-4; Calgary), Steve Laycock of Saskatchewan (4-5; Saskatoon) and Glenn Howard of Ontario (4-5; Etobicoke). Friday’s draws are at 9:30 a.m., 2:30 p.m. and 7:30 p.m. ET.